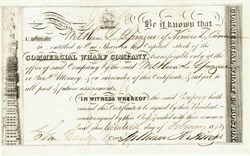 Beautifully engraved historic certificate from the Commercial Wharf Co. This historic document was printed by H. Morse Co. and has block borders a vignette of the commercial wharf with old sailing ships. There is also an embossed corporate seal with a sail ship in the center. This item is handsigned by the Company�s President ( William Pekins ) and Secretary ( E. Bacon ). The company was incorporated in 1832 and the Commercial Wharf was designed and built by Boston architect, Isaiah Rogers, from 1832-34. ADDITIONAL REAL ESTATE. Be it enacted, etc., as follows: SECTION 1. The Commercial Wharf Company, incorporated by chapter fifty-one of the acts of the year eighteen hundred and thirty-two, and its successors, are hereby authorized to acquire and hold in fee simple, leasehold or otherwise, any or all of the real estate, wharves, docks and other structures situated east of Atlantic avenue in Boston between the land, wharf and flats of the Lewis Wharf Corporation and the land, wharf and flats of the owners of � wharf, so-called, and further to acquire and hold all the rights, easements, privileges and appurtenances belonging to or which may be used in connection with such real estate, wharves, docks and other structures. SECTION 2. This act shall take effect upon its passage. Approved February 20, 1900.